Update January 24, 2017: The full version of the Spanish trailer for Overwatch’s Chinese New Year / Year of the Rooster event was accidentally posted early to Twitter. It confirms that it will be a full, three-week event starting today, with its own loot boxes and game mode. Fireworks, chinese dragons and cosmetics aplenty arriving today in Overwatch’s Year of the Rooster update. A leaked trailer, quickly deleted but never lost on the internet, previews it in full, including that the new CTF game mode is not limited to Tracer and uses control maps as its base. For everything else coming to the game soon, have a look at our list of Overwatch updates. Lots of sprays, skins and emotes in there – we’ll get to see them all tonight, along with patch 1.7. 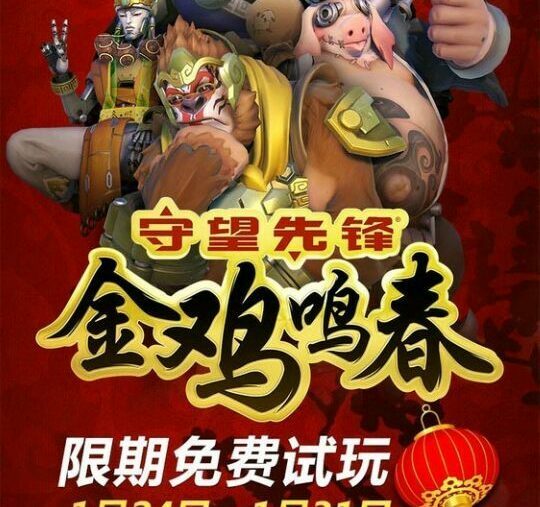 Update January 23, 2017:Looks like the Overwatch Chinese New Year event, Year of the Rooster, is bigger than most expected, with plenty of new cosmetics and a whole new game mode being revealed in a leaked trailer. The trailer, which looks legit and was found on Chinese social media site Weibo, goes through a few skins, then shows Tracer standing triumphantly with a flag. Then those that were already confirmed, as detailed below. The CTF mode is almost certainly a brawl rather than a full new game mode with maps design specifically for it, but we’ll find out tomorrow. Kaplan has discussed in the past that designing a CTF mode with heroes like Tracer was very difficult, so it may prove to be a Tracer-only Brawl. Normal release time for these things is usually around 7pm GMT, 11am PST so look out for it then. The English version of this trailer is also likely due around the same time, as we saw with the Winter Wonderland trailer. Update January 20, 2017:an image has appeared on Imgur, apparently showing four new Overwatch skins. Some more of the new skins to be added in Overwatch’s forthcoming Chinese New Year event, Year of the Rooster,mayhave leaked on Imgur. If accurate, the skins are inspired by the 1592 Chinese novel, Journey to the West. Here’s the Imgur post, or you can check out the image below.As you can see, the new skins are for Zenyatta, Winston, Roadhog and Reinhardt. According to Reddit, the Chinese text reads “‘Journey to the West’ limited skins”. Considered one of the four great classical novels of Chinese literature, Journey to the West is the story of Xuanzang, a Tang dynasty Buddhist monk who traveled to central Asia and India in search of sacred texts. Xuanzang wrote his own account, the structure of which Journey to the West retains, but embellishes. Among the additions is the idea that Gautama Buddha himself gave Xuanzang his task, and provided three protectors who went along to atone for their sins. The new Overwatch skins are apparently based on Xuanzang and his protectors. 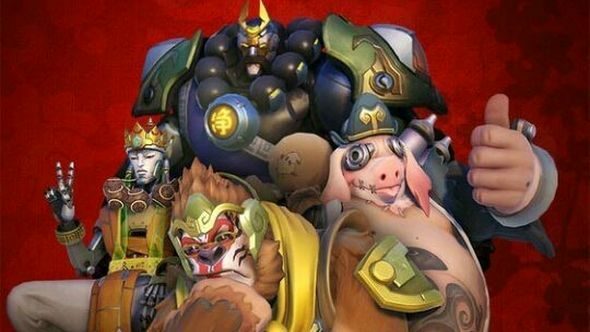 Winston’s is based on the monkey king Sun Wukong, Roadhog’s is Zhu Bajie the pig monster, and Reinhardt’s is Sha Heshang the river dweller, also known as Sha Wujing. This leaves Zenyatta, whose skin is based on Xuanzang himself (also known as Tang Sanzang). Reddit translates other text in the image as: “Year of the Rooster, free trial: Jan 24 – Jan 31”, so the event could coincide with a free week for Overwatch. We say ‘could’ because it’s worth taking all this with a pinch of salt, even though the skins do look reasonably legit. Original story January 19, 2017:As predicted by us and just about everyone else, Overwatch is having a Chinese New Year event at the end of the month. Likely coinciding with the release ofpatch 1.7, it will bring at least two new, probably-Legendary skins for Mei and D.Va, as teased on Twitter by the official accounts. Both look pretty good, in this reporter’s opinion. Debate is to be had as to whether this is a full event, or just a mini-content release of a few cosmetics, much like when Eichenwalde was released and came with a couple of (amazing) Reinhardt skins. Given how soon after the Christmas event we are, it seems unlikely a new game mode and a massive batch of skins is on the way. As mentioned there, it’ll all become available on January 24.